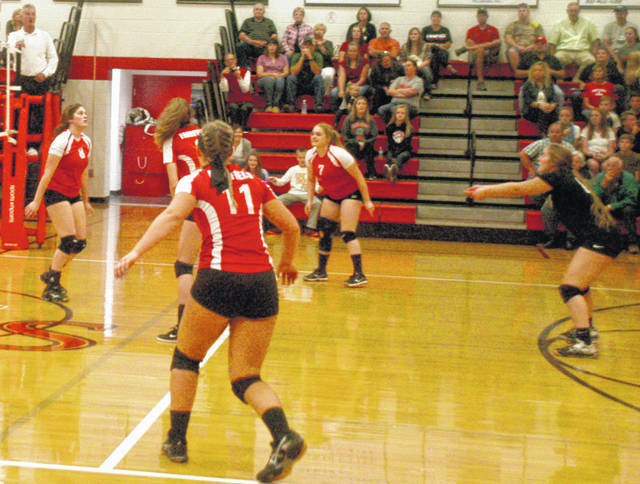 In this Times-Gazette file photo current Fairfield senior volleyball players Kami Magee (far left) and Lauren Arnold (far right) look to hit the ball in a 2017 match. The Fairfield Lady Lions varsity Volleyball team finished fourth in the Southern Hills Athletic Conference in 2017 and are looking to improve on that finish for the 2018 season. The team will be relying on strong play from their returning players and contributions from the new additions to the team. The team will feature three seniors in 2018 and it will be up to them to lead the team this season. The seniors on the squad are Lauren Arnold, Kami Magee and Kaiti White. Arnold and Magee both played pivotal roles for the Lady Lions in 2017 and will be called upon to do the same this season. White missed much of the season a year ago and will be trying to figure things out on the fly this season. The team has four juniors that will be competing with the seniors for time on the court this season. The four juniors are Ally Davis, Grace and Taylor Lawson and Saylor Priest. Look for these girls to step into more prominent roles for the Lady Lions in 2018. The team rounds out its roster with four sophomores and four freshman. The team will be coached by first year Head Coach Lesley Hattan who is replacing Megan Young who led the Lady Lions a year ago. September 17 – The Lady Lions will host cross-county rivals the Lady Tigers. September 27 and 28 – Fairfield will host cross-county rivals Whiteoak and Lynchburg-Clay on these respective dates. October 9 – The Lady Lions will host the Lady Rockets of Fayetteville in their final match of the regular season. Expect to see the Lady Lions improve on their overall record from a year ago after some initial struggles adjusting to a new head coach early in the season. https://www.timesgazette.com/wp-content/uploads/sites/33/2018/08/web1_Fairfield-Volleyball.jpgIn this Times-Gazette file photo current Fairfield senior volleyball players Kami Magee (far left) and Lauren Arnold (far right) look to hit the ball in a 2017 match.